Mustang #22 Caroline Aufiero goes up against the Falcon defense as Fairfield Warde High School Mustangs takes on Fairfield Ludlowe High School Falcons during the FCIAC intra-city girls basketball game Wednesday, February 13, 2019, in Fairfiled, Conn.
FAIRFIELD — The Warde girls basketball team has had its fair share of heart-breaking setbacks this season. The Mustangs suffered tough losses to Danbury, Stamford, Staples, Ridgefield and St. Joseph, and going into Wednesday’s game against cross-town rival Ludlowe, which had won six of its last seven games, they may have been viewed as the underdog. Warde took a three-point lead at halftime and pulled away from Ludlowe in the third quarter en route to a decisive 54-34 road victory over the Falcons at Ludlowe. Leading the way for the Mustangs was junior Alyesha Henry, who just missed out on a double-double, finishing with 17 points, including five 3-pointers, and nine rebounds. Senior Kristina Krasniqi chipped in with 13 points, seven rebounds and three steals and senior Caroline Aufiero had nine points, four assists and two steals. 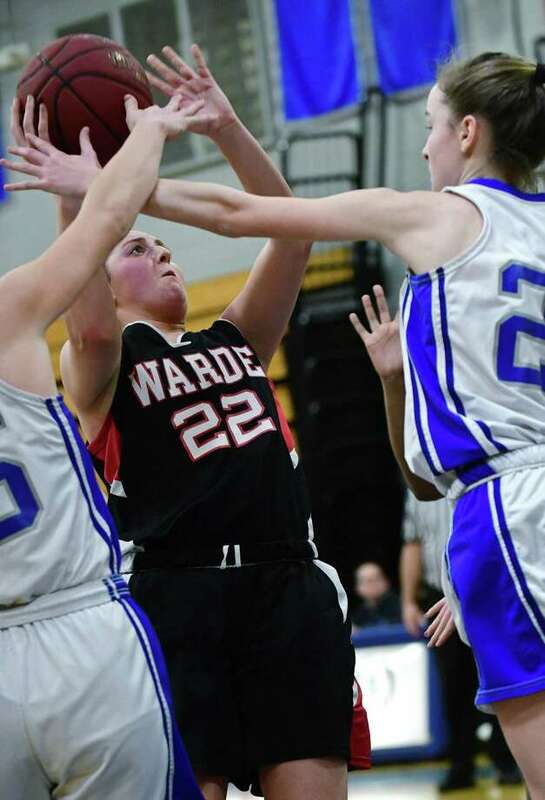 Warde was relentless on defense and forced Ludlowe into a number of turnovers. The Mustangs took the lead for good at 19-18 off a steal by senior Ava Fitzpatrick and fast-break layup with 1:32 remaining until halftime. The Falcons, who were led by Anna Paulmann’s 14 points and eight rebounds, twice pulled within a point, at 25-24 off a 3-pointer by Juliet Bucher with 4:21 remaining in the third quarter and 27-26 off a basket by Anna Paulmann (3:20). Warde outscored Ludlowe 13-2 to close the quarter with a 40-28 lead and the Mustangs never looked back, outscoring the Falcons 14-6 in the fourth to put the game away. Henry drained three of her five 3-pointers in the third quarter, including one with seven seconds left that carried the Mustangs to a 40-28 lead going into the final frame. Henry said it was one of the bigger victories of the season for Warde. Aleysha Henry, Warde. The junior came through with 17 points and nine rebounds in the win. Kristina Krasniqi, Warde. The guard/forward capped her senior season with another victory over the Falcons and had 13 points, seven rebounds and three assists. In the closing seconds of the third quarter, Caroline Aufiero missed the front end of a 1-in-1 and teammate Ava Fitzpatrick gathered the rebound before finding Henry for a 3-pointer with seven seconds on the clock to put the Mustangs ahead 40-28. Danko is 15-2 against Ludlowe since the schools split and the last time the Mustangs lost to the Falcons was in 2011. “We are moving forward and refocusing because Saturday is a whole other game,” said Kinsley, whose team was sitting on the No. 6 seed going into Wednesday’s game. Warde will now gear up for the Class LL state tournament while Ludlowe will be playing in Saturday’s FCIAC quarterfinals. Caroline Aufiero 3 3-5 9; Kristina Krasniqi 4 4-4 13; Ava Fitzpatrick 2 3-5 7; Toni Lamparski 2 0-0 6; Alyesha Henry 6 0-1 17; Kirsten Rodriguez 1 0-0 2. Totals: 18 10-15 54. Juliet Bucher 3 0-0 9; Emma Torello 1 0-0 3; Anna Paulmann 5 4-5 14; Bridget Paulmann 2 2-2 6; Paige O’Connell 0 2-2 2. Toatls: 11 8-9 34. 3-pointers: W—Henry 5, Lamparski 2, Krasniqi. L—Bucher 3, Torello. Fouled out: None.